This post is sponsored by SMARTCANDY. Thanks for supporting Baby Meets City! In any case, far be it from me to head out the door without some type of snack in my bag... the wrath of hungry toddlers is a scary sight, and no one wants to see that - least of all me! But as mentioned, I could stand to step up my game. While the standard snacks will always be present (apple slices, string cheeses, Goldfish or pretzels...), I'm excited to add a little something new to the mix. Have you heard of SMARTCANDY? Brought to you by the parents of two always-hungry kids (who were inspired by Michelle Obama's Healthy, Hunger-Free Kids Act), this new snack comes in four yummy flavors and is packed with vitamins A+B+C, which promotes vision, focus and strength in your kiddos. Oh, and high fructose corn syrup & trans fats are noticeably (& happily) absent. Hurrah! Available online & in stores at Target & Wal-Mart, this new snack is well on its way to becoming part of our daily rotation. And in case you were wondering, Viv's favorite kind is this yummy little gummy (& mine, too)! 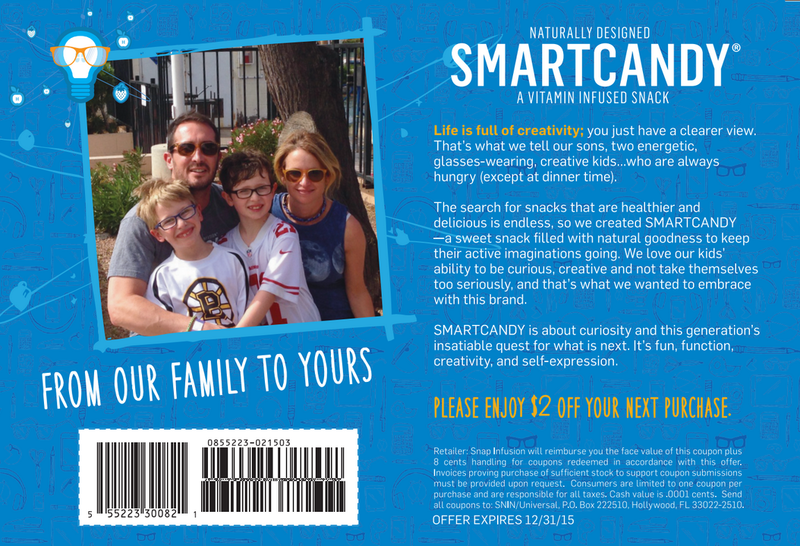 Want to try SMARTCANDY for yourself? Print out the coupon below for $2 off. Woohoo! Thanks for the coupon, I haven't heard of these yet but I have 2 little boys who will really be excited to try them!